Tarot Tuesday! The card for the week is the Two of Swords, representing: Peace, clarity, centeredness and intuition. This card often shows up when you are struggling with a decision. Your mind is saying one thing, and your heart another. The Two of Swords encourages you to find a balance between the two. When your mind and heart come together in friendship, a powerful alchemy occurs. The result is a profound spiritual balance. The way you engage this alchemy is through your intuition. This is the true voice of a mindful heart. The Two of Swords says that it is time to “lay down your sword”. To surrender the conflicts and discord in your life, and be at peace. Whenever possible, extend the olive branch of peace to others, knowing that by being generous with your heart, you will experience more harmony in your life. All in all, this card indicates that you will soon be experiencing a welcomed new sense of clarity! Wishing you a peaceful week! Tarot Tuesday! The card for the week is the King of Wands, representing: Creativity, courage, dynamic energy and self-confidence. The of King of Wands is the most charismatic of all the Tarot’s Kings! He is the one that everyone invites to the party, because they want some of what he’s got—a life rich with experience. He is highly creative, not only in an artistic sense, but also in creating a life filled with adventures and growth opportunities. When this King shows up in your life, he signals a time to boldly go after your passions. To have confidence in who you are and what you want to achieve. The more you fully live the authentic you, the more opportunities will come. Some may call the King of Wands self-centered, even egotistical. Yet, this worldly King is comfortable in his own skin, and knows that sometimes one has to be self-focused in order to achieve their dreams. Let the adventure begin! Wishing you a dynamic and adventurous week! Tarot Tuesday! 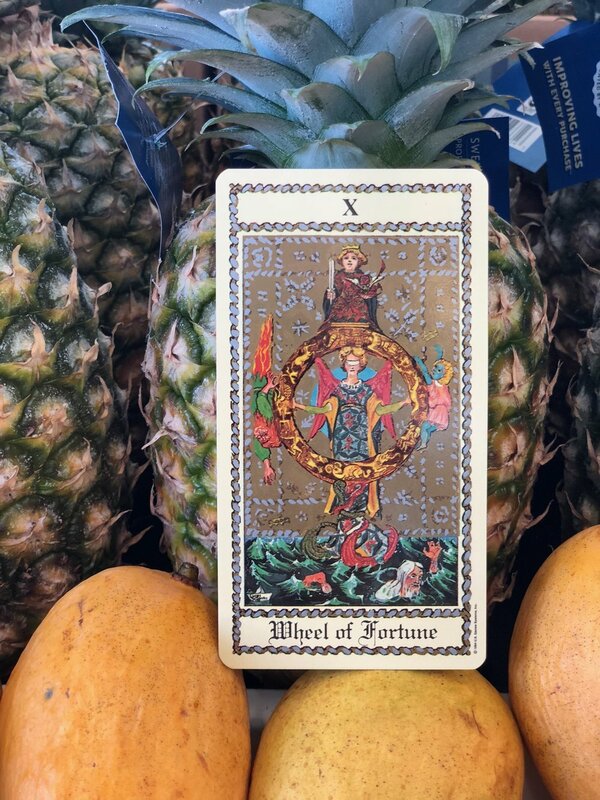 The card for the week is the Wheel of Fortune, representing: Change, opportunity, expansion and flexibility. The Wheel of Fortune indicates the end of a cycle, and the beginning of a new one. It reminds you that life is change, and change is life, and the more you are willing to embrace the winds of change, the more you will benefit from nature’s expanding flow. And, like life itself, the Wheel of Fortune can be a roller coaster ride! One minute up, the next down. Here, flexibility is key. Letting go of attachment to outcomes will help you find centeredness and place you in the eternal flow. The more you go outside your comfort zones, the more possibilities you will find. Be excited about the opportunities ahead, because things are happening fast! A life well-lived is one where you take chances. Be a willing gambler and spin the wheel, then let the chips fall where they may. You are successful for just showing up and playing the game! This month, we reemerge from the watery, hazy-dazy landscape of March, most notably the Mercury Retrograde in Pisces. Now it’s time to regroup and reset your compass towards what you want to achieve next! It’s important to embrace a two-steps-forward, one-wee-step-backwards approach to work with the current planetary energies. Or in other words--Divine Right Timing. All the better to align you with your best potentials. Be patient. Act when the time is right. Breathe. Believe!